Last year, Kotaku featured a Japanese "latte artist" named Kazuki Yamamoto. Taking inspiration from games and anime, he became famous for drawing characters in steamed milk. And now, he's doing that in 3D. Forget drawing flowers and leaves! What makes Yamamoto's milky coffee creations so much fun is how aware of geek culture they are. I mean, how many latte artists do depictions of Anonymous' Kim Jong-un parody? When Kotaku previously showcased Yamamoto's work, we focused on his 2D latte art (such as above). 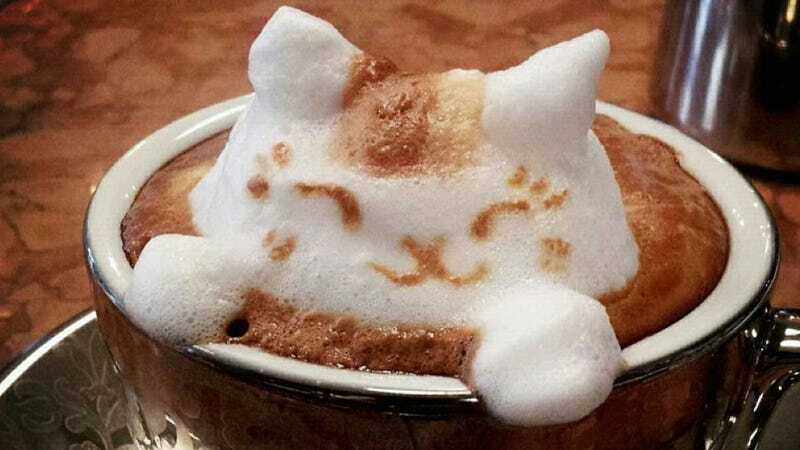 The latte artist has also produced some truly eye-popping—and adorable—three dimensional cups of java. Below, you can see more of Yamamoto's 3D art.